Our professional team of programmers and consultants provide Android Application Development and Industry specific mobility solutions.Android is providing many applications & attractive features to access in phones. Android Application Development is based on the Java-Based Android platform which is one of the fastest growing segments for smart phone applications.Our proficiency with Android SDK, Media APIs, Security architecture and other tools is another feature of our performance that appends superiority to our work. in the ever expanding mobile market. Proven processes further specify our quality standards. Scalable development helps you mould your apps as per your needs. Customization ensures that we deliver what you desire. Affordable solutions comply with your budget. User-centric development improves the apps. Android works with sets of applications, which integrated with an email client, browser, SMS program, calendar, contacts, maps & other more services. All these applications are developed using the java programming language. 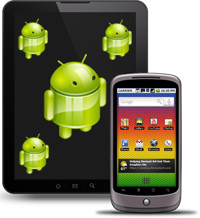 Android software development kit and specific software used for developing an application. Android's client limit is based on direct manipulation using touch inputs that freely match to real-world actions such as swiping, tapping, pinching and reverse pinching to control on-screen things. Software Development Company in India since last nine years and provided services to a number of leading entrepreneurs of India. Web Designing, SEO Services, Web Hosting Services and Multi Level Marketing Solutions.